We have a beautiful collection of Greeting cards for sale. They are all elegantly hand crafted and designed with seasonal papers and crafts. All our Greeting cards are unique and individually themed. Buy your friends, family and loved ones beautifully hand crafted Greeting cards for that extra touch rather than just another card. A gorgeous pale green foil Christmas Tree with sequins and star decoration. Please note, the i..
A gorgeous purple foil fairy on a glitter background holding a paper flower. Please note, the .. These adorable 3D "shaker" cards feature a silver glitter background and embossed card. Pleas.. These adorable Christmas Cards feature a Santa and reindeer print. 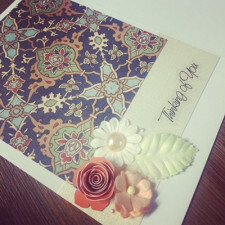 Please note, the image fo..
A beautiful floral card featuring hand drawn stitching, paper flowers and pale blue pearls. Ple..